Ok, so Sky Cafe has become one of my most favorite places. It’s just the best. Deep, deep, deep in south philly, it is an Indonesian BYOB. It’s small, it’s adorable, it’s lovely, it’s cheap, and it serves some motherf’in delicious food. And the “best of the 80’s” music that they play? That’s just the cherry on top. 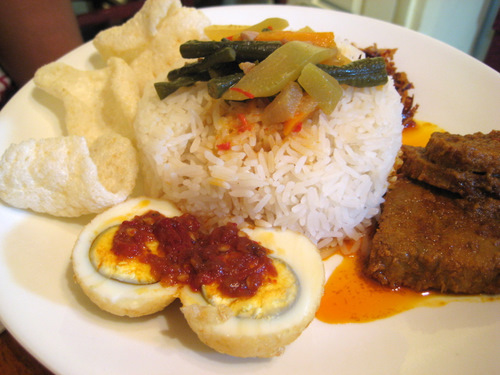 Who doesn’t want to eat delicious Indonesian food while listening to classic Peter Cetera and Lionel Richie? I found out about this place awhile back from a friend’s yelp review. Why did I wait so long to check it out? I am still kicking myself. When you approach it, you would never guess that there would be an Indonesian restaurant in the neighborhood. It’s just hoagie shops and italian bakeries. But do go in. I implore you! It’s so cute and warm inside! The menu is simple. There are rice dishes, noodle dishes, and then some appetizers. 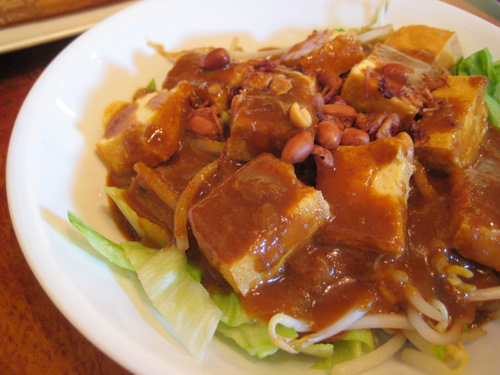 So here we have the salad with tofu and a peanut sauce. Oh. My. Word. This peanut sauce is like my dream! It’s not thick and goopy, it’s thinner, spicy but not too much so, and definitely peanut-y, but not overly so. It’s just amazing. And it was perfect for this salad. Along with lettuce, sprouts, cucumbers, and peanuts, there was tons of perfect tofu in there. I’m not sure how this tofu is prepared, perhaps it’s deep fried? No idea, I just know that I love it. I want to drizzle this peanut sauce on everything. It doesn’t even have to be food, I just want it. And I want these little tofu puffs all over the place too. We also got some fried dough. 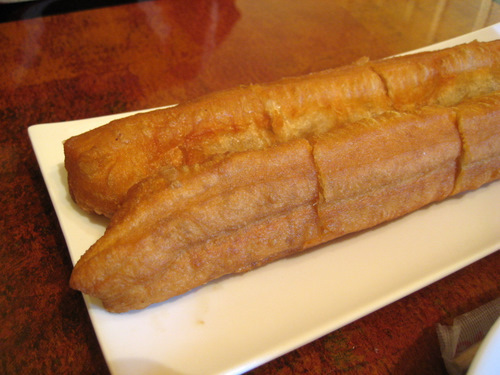 It looks like a big fat churro without all the delicious cinnamon and sugar. It’s good for dipping into soups. I think we also got this at the cambodian restaurant nearby. E got one of the rijstafel plates with beef rendang. There are a few choices of what main meat you can pick, and she went with the beef rendang. Also on the plate are some eggs, fried shrimp chips, rice and veggies, and all the way in the back, which you can barely see, some deep fried anchovies and peanuts. Everything was delicious and the beef was nice and tender. We were fascinated by the anchovy dish, because at first, we couldn’t tell what the heck it was. It didn’t taste like fish. It actually tasted like candy. And it didn’t have little eyes like fish, so we were convinced it wasn’t. Then we just asked and they told us it was little fish. Fascinating! 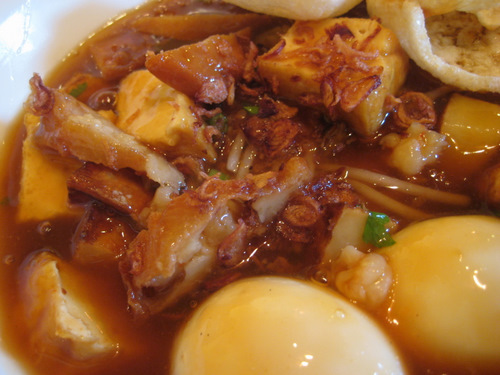 I got the Emie, which is a noodle soup with egg noodles and a whole bunch of other delicious things. 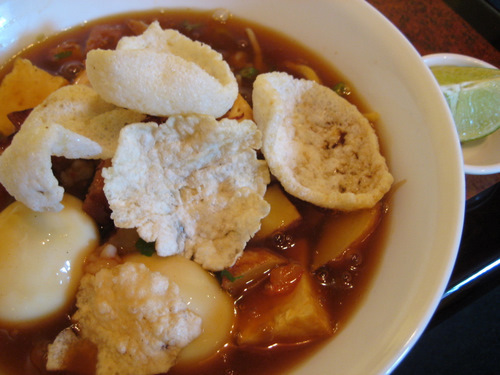 Along with the noodles we have tons of tofu, some hard boiled eggs, shrimp, veggies, shrimp chips, and some shrimp cake type of things, all in a pungent and thick shrimp-based sauce. Uh, so yeah, if you don’t like shrimp, then this is not the bowl of food for you! As for me, I loved every minute of it. This is not a watery soup people, this is like a thick gravy soup. It is not bland. It kicks you in the face with shrimp flavor with every chopstick full. It is just lovely. I want some right now! Our server was sooooooo nice. Like too nice. She was helpful when we were deciding, exceedingly patient in describing, and dealt with all of our questions with grace. Plus she was just nice and happy that we liked the food, and that we came in at all. While there were some take-out orders that night, we were the only people dining in. Plus, we just sat around talking, past closing time, and they didn’t even kick us out! We eventually realized that it was past closing time and finally left, but they would have totally let us stay! Just another reason why I love this place so. E actually lives in the neighborhood, so she’s already been back for take-out. And let me just say how inexpensive this food was. It was almost just wrong how little it cost. So really, if you want some deliciously authentic and overly affordable indonesian food, then make your way down here. This looks like such a hardy meal, I was all for it till I got to the tofu. I just can not eat it.